For a final episode (of the first series), Aria the Animation finishes in a lovely and soothing fashion. There were a few times I was afraid things were going to go overboard (namely the cat scene), everything fit nicely into place. I had to watch this episode three times (over three days) before I started to appreciate it. In those re-watches, I adjusted what I expected the show to be. After the first watching, I was unsatisfied, but after a fourth, I’ve found I enjoy the episode very much. I expect going into episode two, I’ll enjoy the material more than if I had moved on after only a single watching of this first episode. 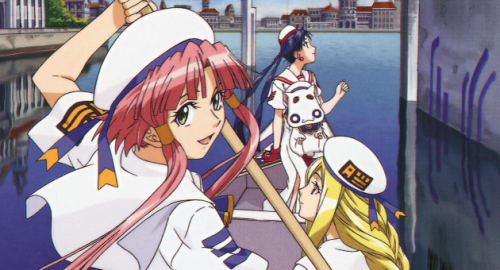 My view of Aria the Animation has followed the same course as Ai’s view of Neo-Venezia, and to a lesser extent the view of the husband in this episode. 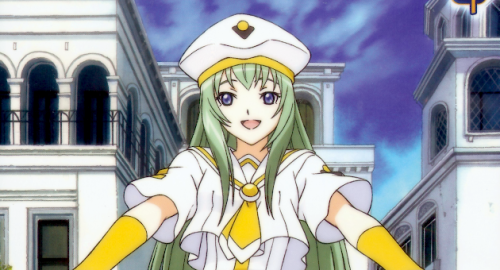 Ai heard so many great things about Aqua, Neo-Venezia, Aria, Alicia, and when she finally experienced it, her Aria experience started out listless. Unenthused. She didn’t see what was so special about it all, even though her sister talked so highly about the place. Still, she gave it an extra effort, this time with different expectations. Akari may have played up the greatness of the baked potatoes, but by now Ai knew things weren’t as great as she’d heard. She lowered her expectations. After 13 episodes, what do I think? It’d still like to see an English dub, one well done. No chance of that now, but it’s no biggie. Some people may not believe it, but I do know people who would really enjoy various Japanese animated series, but reading rather than watching would be a deal-breaker. Still, I could easily see Luci Christian (Duck, Princess Tutu) playing Akari’s voice, and perhaps Vicky Green (Sarara, Bottle Fairy) as Alice. Maybe Reba West (Sugar, A Little Snow Fairy Sugar) as Ai. 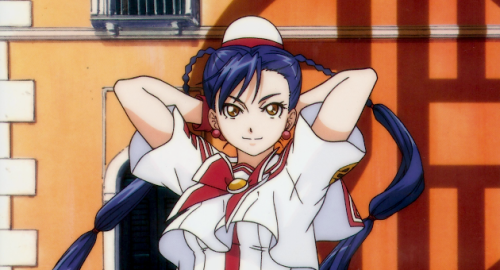 Naturally Chris Patton (Fakir, Princess Tutu) would land the role as Akatsuki. I’ve probably named people working for three different companies, though, not considering if any of those companies have gone under. I’m still not used to the exaggerated faces, such as Akari near the beginning of the episode. That’s just me, though. 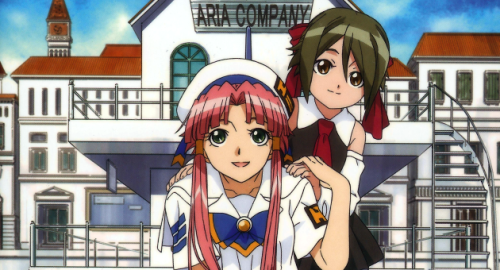 Considering Aria the Animation is based on the comic (although I don’t know how closely), I wonder how many of the faults of storytelling (info-dumps for world-building) were picked up right from there. 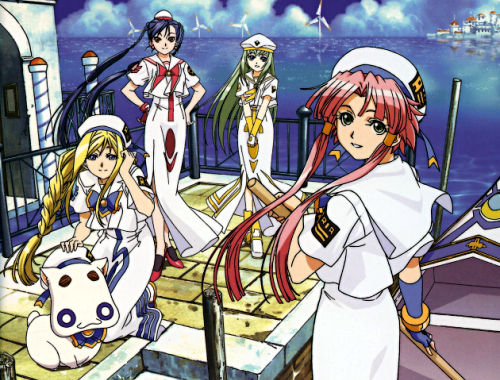 To extend this, it’s my understanding that the next series, Aria the Natural, is 26 episodes of original material. How does it compete with the first series? Is it better in some aspects? Worse in others? I’ll certainly be sure find out when Right Stuf! releases the next series on DVD. My only hope is that they get the world-building right. They wouldn’t drop world-building or anything just because it’s original material for the season, would they? Thoughts on characters. Akari and Ai are just adorable. 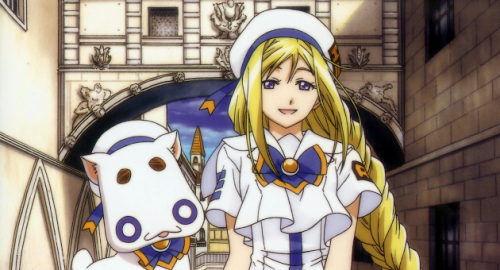 I thought I’d like Alice more as a character, but in the end she isn’t a favorite for me. Maybe she’ll improve as a character by the end of the final series, but as she is now, she still has a long way to go. Looking at Wikipedia, I found out Woody is voiced by Yuuji Ueda (Takeshi/Brock, Pocket Monsters/Pokémon). I’m surprised that I didn’t pick up on it. I also found that Woody’s his nickname, and he really does have an A-name, after all. Grandma’s kept a wonderful personality all her life, one much like Alice and Akari have. The relation between Akatsuki and his brother is constantly well displayed in their interactions, a definite plus for character-building. Al is short. Is this something genetic, or do all the Gnomes find themselves as short as, well, gnomes, after working underground long enough? With as young as he looks, I can’t imagine he’s been working down there for too long, although if his father’s a Gnome, then Al could have lived underground most of his life. Regarding Ai, she appears to be a lot more like Akari in her world view now. The e-mail exchanges have shown that Ai in her youth is similar to Akari, the one who would believe Peter Pan sent her an invitation to Neverland. The quick flash to the past will only ensure Ai grows up with such an outlook on life. Maybe she’ll fit into Aria Company herself, one day. Jun’ichi Satou. I’m disappointed by the general direction Sailormoon took as an animation. I don’t know who was behind it, so I don’t know how much Satou is to blame for 200 episodes containing little overall story and no real character development, along with a signal-to-noise ratio high enough that you can probably trim out 160 episodes or more episodes and not miss anything. Satou made up for it with me in his work on Ojamajo Doremi, another series of about 200 episodes, but without many of the problems seen in Sailormoon. (It’s more forgiving to have a lesser amount of character growth in younger elementary students, especially when they’re not going through quite what the sailor-suited teens went through.) It was Princess Tutu that elevated Satou to God status for me. (This status is to be taken lightly.) I’m certain a lot of research went into Princess Tutu by the team behind the series. For Aria, Satou and company headed to Venice to get things right. Because of this, I can rest assured knowing those Undines are rowing properly and their boats are moving properly. I wouldn’t have noticed if they weren’t, I’m sure. Bravo, Satou and company. Up next, Aria the Natural.